The Rally portable Pickle ball net system with ball holder is a high-end net system exclusive to. 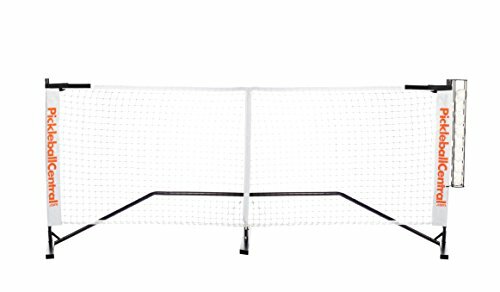 It is identical to the ever-popular USAPA and pickle net portable net systems in terms of set-up. However, this system has a great perk - it comes with an easy-to-attach ball holder. It also features oval tubing (rather than round). this steel, rectangular structure simply perches on the end of the net and can hold up to eight Pickle balls. The Rally portable Pickle ball net system is made with powder-coated, black steel framing measuring 22 feet wide and a seemingly unbreakable black nylon net. The net will stay taut at the necessary 34 inch center height thanks to the Velcro tension system. Sturdy legs are located on either side of the net as well as one in the middle for extra support. Oval pieces make set-up quick - it only takes about 5 minutes. The nylon carrying bag makes transportation and storage a breeze. The bag is compartmentalized with dividers and straps. Every piece of the net system has a place to be kept when not in use! The Rally portable Pickle ball net system really has the most bang for your Buck. The included ball holder is a great bonus accessory for a portable net which will serve you well for years of play. POWDER COATED STEEL FRAME - Sleek black look, durable frame design and nylon net with Velcro straps to keep net tight. New stronger oval post design. If you have any questions about this product by PickleballCentral, contact us by completing and submitting the form below. If you are looking for a specif part number, please include it with your message.